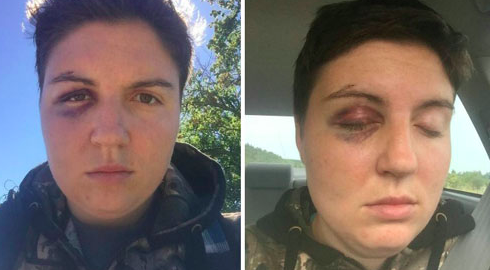 A lesbian professor at Central Michigan University has admitted that she made up a much-publicized story about being punched in the eye by a homophobic man, Michigan’s Morning Sun News reports. In August, professor Mari Poindexter told the paper that, at a Toby Keith concert, a man had called her a “cross-dressing fag,” then punched her in the eye and spat on her in the parking lot of a bar later that night. Pictures that she posted of herself with a black eye went viral on social media, with Poindexter receiving an outpouring of support from friends and from her university. But Poindexter wavered when police asked her to watch surveillance video from the parking lot with them. That same night, her friend called local 911 to say that Poindexter seemed she was going to harm herself. On the 911 call, Poindexter told her friend she had made up the attack at the bar. She also admitted she’d punched herself in the eye. After that, according to court records, she retained a lawyer and entered psychiatric treatment. She was charged with lying to a cop and filing a false police report, but in time the cop-lying charge was dropped in exchange for a guilty plea on the false report charge. She was fined $225 and given six months probation. But her lawyer admitted that she’d “made the mistake” in fabricating the story of the attack in the bar later that night.